A key role of leadership is helping people overcome challenges and achieve results. 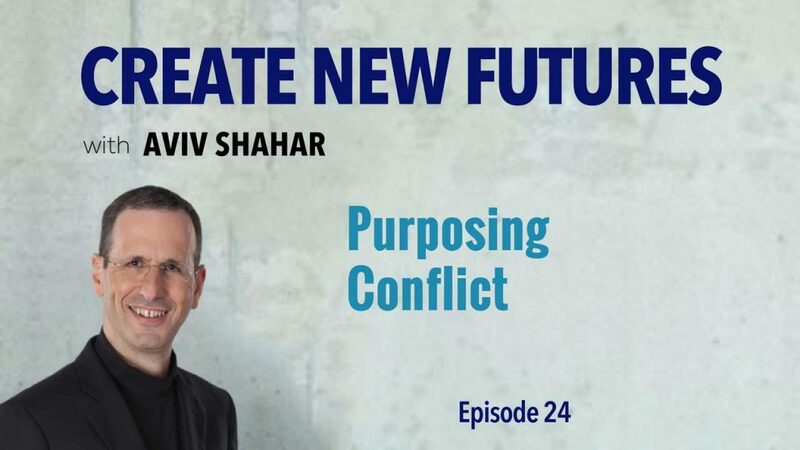 In this article/podcast, you will discover a new process to help you reframe conflicts. This approach will enable you to lead your teams beyond just meeting challenges resiliently. You will empower them to unleash personal and professional growth. Why is trying to pivot immediately from a problem to the solution often a suboptimal approach? There are situations for which this simple binary equation doesn’t work because the solution cannot come from the problem itself. As Einstein taught us, we cannot solve a problem at the same level at which it was created. A brief demonstration reveals the limitation of the “binary solutioning” approach. Position the palm of your hand close to your head, right in front of your eyes. You will find that the palm occupies almost your entire field of vision, leaving little room to see anything else. When you pull your hand away from your face, however, you can see your palm as well as the entire space around you. The same is true with a problem: you experience a new perspective when you step back to see a bigger picture. We find solutions, therefore, by a) gaining a new and broader perspective, b) addressing the root causes, and c) introducing a new level of thinking that transforms the map of meaning that created the problem in the first place. 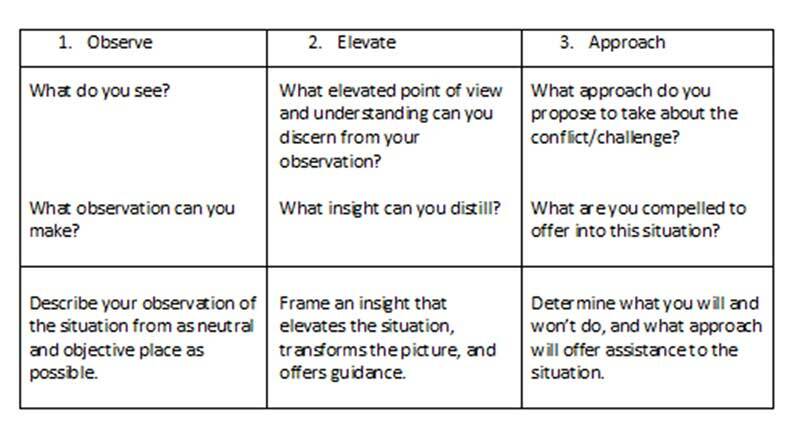 Here is the alternative thinking framework and process I proposed we use to lead a conversation that offers a path from conflict toward resolution. I placed three napkins on the table, naming them observe, elevate, and approach. After listening to Sara describe her understanding of the conflict under discussion, my observation is that there are six points of difference that comprise the bigger conflict. I attempt to unpack these differences, name them with greater specificity, and separate the amorphous feeling of conflict into a concrete set of data points. This first step allows me to bring a new level of clarity to the situation. It is easier to resolve a series of specific concerns and find exact remedies than it is to try to address a cloud of conflicts. In this, I step back to observe and gain a bigger perspective. I seek to validate the issues on the table rather than pivot immediately from problem to solution. By immersing myself in these observations, I am prodded to find the fulcrum where a new level of appreciation can be accessed, which I do by shifting from the “what” inquiry to the “why” inquiry. “Why” is a purpose inquiry. Instead of reacting to eliminate conflict immediately, I seek to understand its purpose. The game-changing insight comes with the realization that conflict has a purpose. I propose not only that the occurrence of conflict is purposeful, but that conflict has a dual purpose. At the individual human level, conflict offers a growth opportunity. Through conflict we develop capabilities and capacities that we otherwise would not cultivate. Conflict is a central character in the developmental drama of everyone’s journey. At the planetary and universal level, conflict is a technology that sparks innovation and breakthroughs in the evolutionary process by serving as a catalyst and trigger. A common human response to conflict is to remove the problem, as that is believed to eliminate the source of pain and struggle. Once we recognize the purposeful opportunity conflict offers, we realize that a better approach is to use pain and struggle as fuel for learning, development, and growth. 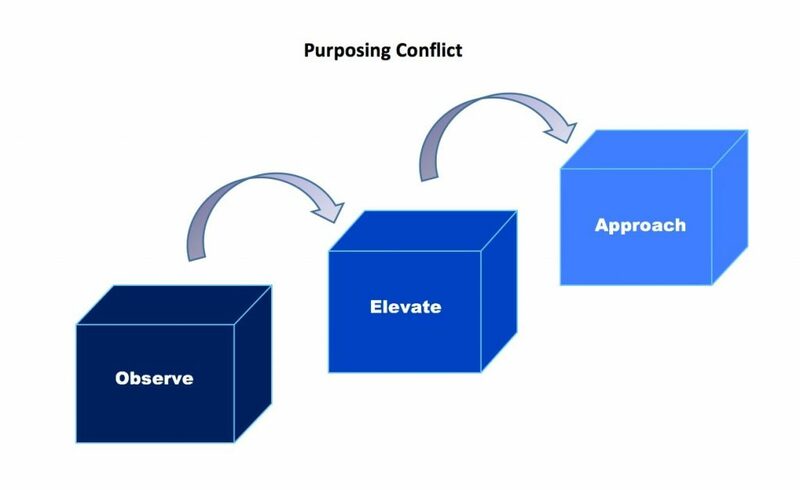 These layers of understanding point to a key realization: how we handle conflict determines whether we grow and develop, or we freeze and arrest that development. Our response to challenges and resistance determines whether we participate constructively in the evolutionary process they offer. This process of deliberation is part of my second napkin of “elevate,” which arises from the initial set of observations. With these insights, I now am ready to propose an approach and offer process assistance. In this step, I suggest that there are two complementary approaches we can take with respect to conflict. The first approach is one of compassionate support: we offer encouragement, guidance, thinking frameworks and techniques without trying to take away the conflicts people encounter on their development journey. In this approach, we advise, support, and offer the wisdom of experience. We do not, however, take from others a conflict they must face. Even if we could do that, why would we deprive them of the gift of the growth opportunity inherent in their struggle? The second approach is one that acknowledges that progress, maturation and growth bring about change in the problems we need to handle. If this year we face the same kind of problems we struggled with last year and the year before, the implication is that we have made no developmental change and progress. Embracing new challenges, on the other hand, is a sign of progress, maturation and possibly new elevation. How do we know that we are progressing on our journey? When we discover that this year we are dealing with a new set of challenges that open the door to new opportunities for us to embrace. By refusing the knee jerk reaction of the binary equation from problem to solution, and by stepping back to observe, elevate, and formulate an approach, we are able to escape the Binary Solutioning and the Einstein paradox within it. Fortified by the above insights and mindsets, Sara and I continued our conversation, reflecting on how this information might help address the situation faced by our loved ones. We all must deal with conflict. Here is a radical thought: to be alive is to be in conflict. Reversing this construct would ask: If you are experiencing no conflict whatsoever, are you alive? What about the conflicts you face in your life? What observations and insights can you develop? What approach will you take to reveal and engage the development purpose of the conflict? How will you use an existing challenge as an opportunity for growth?